When we first arrived in Greenville we went to a lot of estate sales, mostly to furnish our new home. But I always would make a bee line for the kitchen first. One of my best finds was my electric waffle iron. It has two removable cast iron plates, which makes it easy to clean. As long as I keep them well-seasoned I don’t have any problems with sticking. I like to make Belgian style yeast waffles. Sometimes, when we have an abundance of eggs, I make what we call a breakfast dinner around here, which involves pancakes, or waffles, eggs and cheese, turkey bacon and sausage, and grits too. I originally found my waffle recipe here at BigOven.com. I modified it to use a multi-grain flour, to make it non-dairy, and I also like to use more cinnamon. I double the recipe to feed the five of us and have a few left over waffles. But I don’t double the amount of yeast! I’ve been using my modified recipe for years now. My trusty old electric waffle iron. The batter after rising for about 45 minutes. My beaten egg whites just before I fold them into the batter. I acquired this waffle iron at an estate sale. It has removable cast iron plates. Waffles, eggs, grits, turkey bacon and sausage…dinner time. Mix ingredients until batter is smooth.Cover the bowl and allow the batter to rise in a warm area for about 30-45 minutes. Just before the batter is ready, beat the egg whites until they form a stiff peak.Gently fold the egg whites into the batter. I set my well-greased waffle iron at 3 1/2 and allow it to get fully heated. Pour batter until to just short of the edges and close the lid. Bake the waffle until golden brown, approximately 3 minutes. Waffle maker envy! 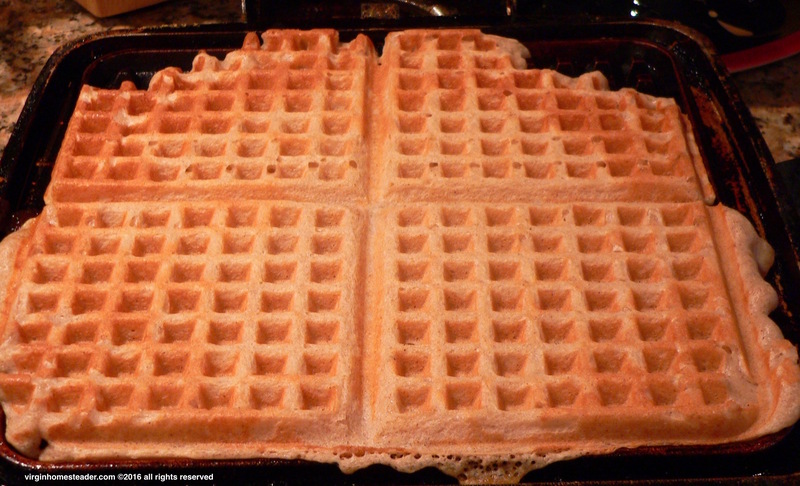 Just made yeast waffles for the first time this month, now searching for an old smooth cast iron waffle maker. Yours looks like the one my mom had, before Teflon became the secret ingredient to easy release. Apparently new cast iron is made with a powder coating, so it isn’t as smooth as the old stuff. And it turns out there is quite a community of waffle iron collectors, so the challenge is finding one for cooking, not for collecting. I am going to try your recipe–we need them milk-free here, and this looks delicious. Well maybe mine’s worth some money then! I’m guessing it’s from the 70’s maybe. Let me know how that recipe works for you. I like coconut milk and oil, but I’ve also used plain soymilk, and almond milk, and I’ve used grapeseed oil instead of coconut oil.